UPDATE: Europe is paying for its past excesses: European interest payments as % of GDP. Germany auctioned 6 billion euros of 10-year government bonds, but attracted just 3.889 billion euros of bids, a bid-to-cover ratio of just 0.65. Six of the last eight bond auctions have seen bids below supply. In these cases, the Bundesbank has bought the remaining debt. German yields are rising as a result. Germany’s 2-year yield is up 0.06% to 0.44% and 10-year yield is up 0.13% to 2.12%. Belgian yields are soaring to new highs on reports that the bailout of Dexia was failing. Belgium’s two-year yield rose 0.69% to 4.98% and 10-year yield increased 0.40% to 5.47%. In France, also a partner to the Dexia bailout, the 2-year yield rose 0.14% to 1.86% and the 10-year yield jumped 0.15% to 3.68%. No news other than the above is pushing up rates across most of Europe. Greece’s 1-year yield skyrocketed 38.6% to 306.7%. The 2-year rate jumped 4.6% to 117.9% and the 10-year year yield rose 0.18% to 29.04%. All are record highs. Over in Italy, 2-year yields rose 0.17% to 7.15% and 10-year yields increased 0.15% to 6.97%. So now, let’s see an updated table of where Europe stands in its ability to pay the interest on its debts. As you can see on the above table, only Portugal had a significant decrease in interest payments going forward. In contrast, Greece, Ireland, Belgium, Spain, and France all say significant increases. Whereas previously, only four countries had interest going forward exceeding 3 percent of GDP, six nations now face that situation. Clearly, as anybody watching the stock market decline here knows, the European debt crisis is getting worse and the European leaders have yet to find a solution. Unfortunately, with the budget mess in Washington and debt-to-GDP ratio of about 100%, higher than most of those “risky” European nations, the United States will soon be facing the same problem. Even as Bank of America and other major lenders back away from charging customers to use their debit cards, many banks have been quietly imposing other new fees. Need to replace a lost debit card? Bank of America now charges $5 — or $20 for rush delivery. Deposit money with a mobile phone? At U.S. Bancorp, it is now 50 cents a check. Want cash wired to your account? Starting in December, that will cost $15 for each incoming domestic payment at TD Bank. Facing a reaction from an angry public and heightened scrutiny from regulators, banks are turning to all sorts of fees that fly under the radar. Everything, it seems, has a price. Banks can still earn a profit on most checking accounts. But they are under intense pressure to make up an estimated $12 billion a year of income that vanished with the passage of rules curbing lucrative overdraft charges and lowering debit card swipe fees. In addition, with lending at anemic levels and interest rates close to zero, banks are struggling to find attractive places to lend or invest all the deposits they hold. That poses another $8 billion drag. Put another way, banks would need to recoup, on average, between $15 and $20 a month from each depositor just to earn what they did in the past, according to an analysis of the interest rate and regulatory changes on checking accounts by Oliver Wyman, a financial consulting firm. For consumers, the result is a quiet creep of new charges and higher fees for everything from cash withdrawals at ATMs to wire payments, paper statements and in some cases, even the overdraft charges that lawmakers hoped to ratchet down. What is more, banks are raising minimum account balances and adding other new requirements so that it is harder for customers to qualify for fee waivers. The first change–new rules on overdraft and debit card swipe fees–come straight from new government regulations. The latter–low interest rates–come from the Federal Reserve. I will focus on how low interest rates hurt banks and consumers because it is not easily observed. Interest rates near zero give banks little room to make money. In the good old days, banks would take deposits and use the proceeds to lend or buy bonds. Just a few years ago, banks could easily buy short-term debt yielding two or three percent. Now, it earns less than one percent. Banks today could choose to take on risk and earn about four percent lending money to a home buyer, if it can find a credit-worthy borrower. Just a few years ago, mortgages yield seven or eight percent. The spreads banks earn have clearly declined, giving them less opportunity to earn a profit or even to cover expenses. Look at money market funds, for example. With the government’s 3-month T-bill yielding 0.01 percent, money markets that invest in those securities lose money even when it pays no interest because of fund expenses. Even the 3-month interbank rate at 0.46% makes it difficult for money markets investing in commercial paper to earn a profit. Normally, banks make money using the risk spread or the time spread. With the risk spread, banks borrow cheaply and lend to riskier clients, booking a profit on the risk taking. With the time spread, banks pay out lower short-term interest rates and collect higher long-term interest rates. With the current environment of low rates all around–a result of deliberate Federal Reserve policies–earning a profit in normal banking operations has become impossible. Instead, the banks are forced to initiate or raise fees. Of course, the government loves this. The government creates this problems, consumers blame the banks for the new fees, and then the government steps in to further regulate the banks. Government creates the problems without taking the blame, then solves it and takes all the credit. Call me a ‘conservative liberal’ please. Up until now, when people have asked me what is my political philosophy, I’ve said that I’m a libertarian republican, both lowercase. In other words, I believe in a republican form of government (representative government with the different classes and powers balancing each other) and that this government should have powers limited by a constitution. While this still describes me, I will now be calling myself a conservative liberal. With the Declaration of Independence, America was dissolving the political bands connecting it to Britain. America was not dissolving the bands that held its society together. Not once does the Declaration of Independence mention society or changing the social system. 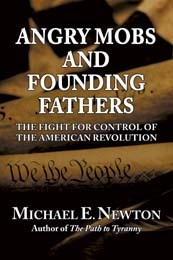 One Founding Father even lamented that, amid the chaos of the revolution, “For the want of civil government the bands of society are totally disunited, and the people…have become perfectly savage.” This destruction of the bands of society is not what the Founding Fathers wanted and they worked hard to prevent it. 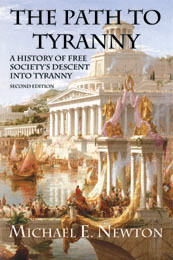 If Britain were to overthrow its monarchical government, that would be a radical change in its society. However, for Americans, who had no inherited classes or titles, dissolving the political bands between Britain and America would leave society virtually untouched. Although the signers of the Declaration of Independence could not be considered conservative from a British viewpoint, they certainly were from an American perspective. Therein lay the delicate balance. The Founding Fathers wished to protect the liberties of the American colonists and stop British tyranny while still maintaining law and order. However, unlike many libertarians, and this is why I am abandoning that moniker, I do not want overly rapid change. While I would love to see a dramatically smaller government, I do not believe we can go from a government spending 40% of GDP to one spending just 10% of GDP overnight. It will take many years. Drastic changes in the nature of our government done overnight would create so much chaos that it would give demagogues the opportunity to seize power. This makes me a conservative in the classical sense of the word. So please, call me a conservative liberal. More so, learn what it means to be a conservative liberal and we can follow in the footsteps of our Founding Fathers. A couple of laws are often proposed to stopped these huge bills from being rushed through Congress. One proposal is to establish a waiting period for all bills. The Republicans in Congress established a three-day waiting rule on all bills, but this rule has no legal binding. The second proposal that is often heard of is to limit bills to a single item. This would make bills easier to understand and would also stop Congress from inserting unpopular items into popular bills to sneak them through Congress. If only we had some sort of precedent to establish a waiting period and ban omnibus bills… But in fact we do. Back in ancient Rome (98 BC), the Lex Caecilia Didia established a 17-day or 24-day waiting period (there is some debate on this) between the publication of a law and voting on it in the assembly. It also banned bills that included many unrelated provisions. Thus, about two-thousand years ago, the Romans found a solution to our current problem. Unfortunately, laws like this did not save the republic. Similarly, a law like this for America might help, but cannot solve our problem: the desire for more government. Europe is paying for its past excesses: European interest payments as % of GDP. Now, these debt figures account only for federal government spending. Many countries, most notably the United States, also has state, provincial, and local governments with their own debts. Additionally, many of the debt-to-GDP estimates are from 2010. Thus, most of the above countries have debt-to-GDP ratios and interest expenses even worse than calculated above. Clearly, we can see why Greece is in trouble. If it were to refinance its debt at market rates (it has been refinancing through Euro-zone subsidized loans), its interest payments would exceed its GDP by a half. Italy is also paying for its problems. So far, Italy has received no help from any bailout fund and, as of now, will have to refinance its debt at market rates. As such, it will cost Italy 8.5% of its GDP to do so. If it had a more reasonable debt level and interest rates, say those of France, Italy would have an additional 7.4% of GDP to spend or save. Most surprising is how everybody is ignoring Portugal. Portugal has already received bailout funds, but that won’t last forever. If Portugal were to return to normal by accessing the market, interest payments would eat up 15.3% of its GDP. That’s a lot to pay for past mistakes. Belgium is another sleeper. It’s problems are just as bad as Spain’s, yet nobody is talking about them. Furthermore, Belgium has not been able to form a ruling coalition since elections were last held on June 13, 2010, breaking all records. Furthermore, the New Flemish Alliance party is Belgium’s largest political party with 17% of the vote. This party favors the “peaceful and gradual secession of Flanders from Belgium.” Lots of problems there, but nobody seems to be talking about it. So far, Europe has paid for the mistakes of Greece, Portugal, and Ireland. However, Italy’s debt is 2.7 times the combined debt of those three nations that are already receiving bailout funds. That makes Italy both too big to fail and too big to bail out. Europe is facing problems on multiple fronts: Greece, Italy, Portugal, Ireland, Belgium, and Spain, to name a few. So far, Europe has successfully staved off depression by bailing out the smaller, weaker countries. But as the problem spreads to more countries, and bigger ones at that, Europe is running out of room and options. School systems taught little children the evils of drinking. When those kids came of voting age, many voted for prohibition. The leadership role taken by women’s group in passing and then repealing Prohibition. Prohibition would never have been possible without the income tax amendment ratified in 1913. Prior to 1913, the federal government got much of its revenue from excise taxes on liquor. With the income tax, the government no longer needed that revenue stream and was willing to go along with Prohibition. Anti-German sentiment during World War I helped push Prohibition because most of the beer brewers were owned by German immigrants. While the documentary focuses on Prohibition, it also clearly reveals the dramatic political change that was taking place in the United States at the time: a switch from small-government republicanism to democratic progressivism. I watched most of this series on my iPod while riding the NYC subway, so was unable to take notes. Therefore, I offer no full review. 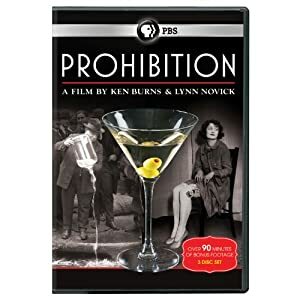 Hopefully, the interesting tidbits listed above will convince you that this documentary on Prohibition is worth watching.